We are on the home stretch of FY18 and microcap and small caps indexes have continued to demonstrate strength. Once again, microcaps significantly outperformed large caps. The S&P/ASX All Ordinaries Accumulation Index returned a -3.69% for the Q3FY18. In contrast, the S&P/ASX Emerging Companies Index posted a -1.85% return in comparison for the Q3FY18 quarter. However, a negative absolute return is nothing for investors to get excited about. In what was a torrid quarter for equity markets globally the relative outperformance by microcaps was pleasing in an otherwise disappointing quarter for equity investors. 1 year annualised returns up to the end of Q3FY18 provides a more contextualised view of the recent quarter results with the S&P/ASX All Ordinaries Accumulation Index returning 3.65% and the S&P/ASX Emerging Companies Index delivering a solid 17.41% return for the year ended March 2018. The 3rd quarter of FY18 saw the closure of The Boat Fund which was founded by Sam Orr and Ron Shamgar after nearly 5 years in operation. Thus, we have removed it from our coverage universe. This is a disappointing outcome for us as we like to have as many reference funds as possible in our universe. Another fund which announced that it was closing this quarter and subsequently removed from our review universe was the Acorn Capital Microcap Fund. This is a particularly disappointing closure for our quarterly performance review. The fund had the longest track record of any microcap fund in our universe, has been around since 2001. Sadly, with only $25mil in AUM, it would have been hard to justify the economics of keeping the vehicle going. It is also disappointing from the standpoint that Acorn run a microcap strategy within a LIC vehicle (ACQ: ASX)and being able to compare the performance of the same strategy in two different vehicles is always an interesting exercise. We are thus left with the Spheria LIC (SEC: ASX)and the Spheria Australian Microcap Fund to perform this comparative exercise. 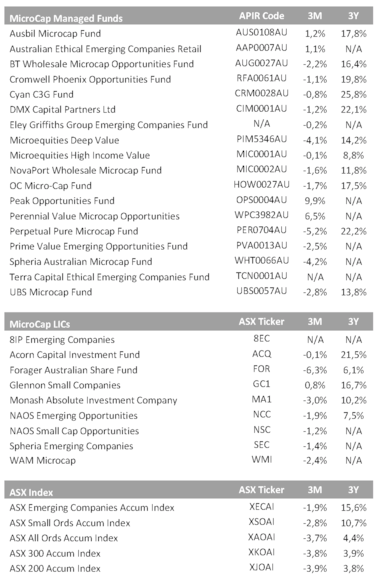 Stand out performances from active managers in the quarter came from microcap vehicles managed by Glennon Capital, Australian Ethical, Peak Asset Management and Ausbil Investment Management. This trio of manager all managed to deliver positive absolute returns for the quarter. A significant accomplishment when the majority of funds and indexes were in the red for the quarter. Avoiding the downside is just as important capturing the upside in active fund management. However, a fund worthy of a special mention is The Perennial Value Microcap Opportunities Trust which delivered a positive 6.5% return for the quarter net of all fees. We previously highlighted them in our Microcap Monthly Newsletter as the fund has returned in excess of 50% net of all fee over the last year. Given most managers struggled to achieve positive returns in a volatile quarter for local and global equities, the Perennial team delivered a very noteworthy result for the quarter. However, as always there are the managers which lagged both the index and their peers for the quarter, with Forager, Perpetual and Spheria on the wrong side of the scoreboard this quarter. Now, my usual caveat applies, no investor should judge a manager on a single quarter’s performance no matter how positive or negative the performance was. Over a 3-year time horizon, active microcap managers, by and large, have an excellent track record of delivering alpha to their investors. In addition, they have delivered superior returns versus that of the mainstream index funds and ETF’s. This evidence should be food for thought in an investor’s overall asset allocation decision. Stand out performers over 3 years are Cyan, Perpetual and DMX. How much should I be paying my active microcap manager? With the royal commission into banking and financial services more broadly front and centre in the media most days, it is perhaps pertinent to review the fees being charged by active managers in the microcap space. Every single one of the 27 vehicles charges a performance fee over some benchmark. The average performance fee comes in at just under 19%. 22 of the vehicles charge at least 20% as a performance fee. The average management fee is 1.14%. 2 vehicles don’t charge a management fee relying just on performance fees. There is little or no difference between the fees charged by LIC’s and their managed fund counterparts. If you are paying around 1.1% in management fees and a 20% performance fee over some benchmark you are paying around the market/industry norm for this type of product. However, with such a clustering of fees around these two points one would need to question how much competition is happening on fee level basis at least between the fund manager’s in the microcap space. The second question which is a corollary to the first question is are investors getting good value for money for the fees they are paying? Ultimately that can only be answered when looking at the performance achieved by the various fund managers versus other investment alternatives. Thanks Mark, any chance we can get the charts a bit larger? They're a little tricky to ready (or I'm going blind in my old age). Hi Mark, thanks for this. I'm curious to know which are the 2 vehicles with performance only fees if you are able to name them? What about Katana ASX:KAT? Is it a small cap LIC?